As I sit in the cancer treatment center in Morgantown, WV reading the paper, as I always do as my Mom receives her chemo, I can't help but skim the obituaries. I, for whatever reason, read an obituary of a woman I've never met, Flora "babe" Willard Hawkermale. As I read her obit to the end, I see that there is a fund that she requests donations for, which is what brought me to "Justin's beach house". My curiosity got the best of me so I googled it. After reading Justin's story, I'm now sitting here in tears at what an amazing tribute to what seemed to be an incredible young man who was full of life. As I read the tributes and praises of your foundation, I find my mind wondering back to April 17 of this year. This was the day I lost my 28 year old best friend to her 5 year fight with lymphoma. The last beach trip we took together was to Rehoboth Beach the year she was diagnosed. She couldn't be in the sun so going to the beach would have been pure torture, but I'm sure she's got her toes in the sand with a beer in her hand. As I said before, my Mom is in her own fight with stage 4 colon cancer. Cancer unfortunately affects us all in some way or another, but what this foundation does for families is unspeakable. A glimmer of sunshine and smiles to a cancer patient is almost as good as a clear scan... and this is what you are providing cancer patients and their families. May god bless you all and the selfless work you do! Becoming an adult means I need to take responsibility for my self, my family and my community. As part of my preparation for that day, I will be involved in a project to do acts of kindness. I have been coming down to Bethany Beach with my family ever since I was born. I really enjoy the special time with my family and am always looking forward to our next visit. I was excited when I saw this big Adirondack chair being built on Route 26! Then I saw Justin's Beach house written on it. I was very curious and googled it on the internet. When I learned about Justin's life, his strong determination to fight cancer and his love for Bethany Beach I wanted to to be a part of helping fulfill Justin's dream to help others. I would like to contribute in some way to providing that special time for families that are coping with cancer to escape to the peaceful place where everything is better. My family always says when we cross the Bay Bridge things are better! How can I help? I am down at the beach until Aug 19. I wasn't sure if there was something you needed for the house, for the families or if you would prefer a monetary donation. Please let me know how I can help. "Craig, was a pleasure to meet you, and your words are very similar to the beginnings of Special Love/Camp Fantastic, we grew because of a need to bring comfort and care to families who have children with cancer. I received positive comments from the board, and look forward to assisting where we can, and to get word out to families. You have a wonderful place, and with one visit you can see all of the love that went into planning the home. Hat's off to you, and may this be the beginning of bringing joy to families with their vacations. I have cc those in attendance, and will share our thoughts with you. When Dave Smith did our survey, that is what we are rated highest on "FUN", so we have lots in common. Till we meet again, take care. " It was such a gift to meet you and learn about the beautiful home you and MaryEllen have created from your loss. I look forward to our next meeting. One of the things I got done last weekend was to book a house for my family's vacation. We will be in Bethany from June 24 – July 1. Please check your calendar to see when you and MaryEllen and the rest of your family could visit us for dinner and/or to chill at the beach. We're staying at 43 N. Atlantic. I'm sure my family would want to see Justin's beach house as well. Like you, we had to find a positive from our loss; a way to give back to those who had helped us in our cancer journey and help those who would come after us. We started Becca's Run in October 1997 – 4 months after Becca died from her GBM. We had about 800 people at the first run, most of whom were Catholics. Our main advertising vehicle was the Catholic churches in the DC area and the Catholic high schools since 3 of our 4 children went to 3 different Catholic high schools. Your priest friend will be happy to know that the Catholic network is alive and well in the DC area. But what really helped us is that thousands of people knew Becca's story because there was a series of stories in The Washington Post over almost 2 years. We have boxes of letters from people whose lives were touched by hers. The stories are still online and we have a link to them from our Run website http://www.beccasrun.org/about.htm The link to the stories is at the bottom of this page. The paper copies have more photos but the online version has the beautifully-written stories. I'm not too surprised that we felt an immediate connection. I equate it to being in a foreign country and finding someone from your home town – we speak not only the same language but the same dialect. It's a small club and we share one of the most life-changing experiences you can have. Thanks you for being in touch." "My name is Michele Graffis from Bethlehem,PA. 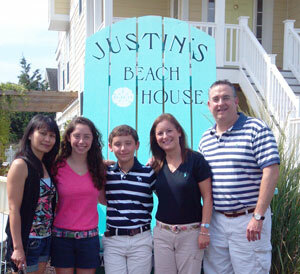 Friends of ours,Laura, Steve,Katie, and Sarah Neary are at Justins Beach House this week! We think that this is an awesome way to honor your son, Justin! We love the Neary family! Our 21 year old son, Derek, died this past December. He was diagnosed with ALL in March of his senior year-2008. He did well through 2009 and relapsed in March 2010. He had a bone marrow transplant last summer and was able to come home feeling pretty well. During the early fall, he had difficulty eating. The doctors realized that he had graft VS host in his intestines and it later went to his liver. He passed the week after he turned 21. He is greatly loved and deeply missed! This summer, through his memorials to Angel 34 Foundation, they were able to send 8 families to the beach for DEREK'S CAMP FLIP FLOP. My husband, Dale, 17 year old son, Andrew, and I were able to spend a lot of time with the families. My friend and I were chatting about how great it would be to have a house for families to go to at the beach. Derek never missed a summer at the beach. We drove down for the day last summer after transplant. I admire you for doing this in your son's honor and for all the kids and families going through cancer treatments! We decided to continue collecting blankets for the children's hospitals in Dereks honor. You can read his story at derekshugs.org. Though I haven't e-mailed ya'll recently, I've been following the progress on Justin's Beach House closely and with great wonderment (is that a word?, if not I still like it!) We are so excited about what your family has accomplished in Justin's memory! The Palmer family has survived (bearly) the first anniversary of our Michael's passing of brain cancer (April 24th). It has been very difficult getting through these "first anniversaries" as I'm sure you also experienced with Justin's passing. We were then blessed with the time to support Donn's dad as his earthly journey was ending. Tom passed away on our 33rd anniversary, May 21st. at the age of 89. Being with him every day for four weeks was so wonderful and heart breaking at the same time because it was a replica of our journey with Michael. But God is good and we are doing our earthly healing. We look forward to volunteering to support Justin's Beach House in the capacity we are able. I would love to provide home-baked cookies to the residence each week if you thought that would be enjoyed. Donn, Thomas (our autistic son) and I are able to do some home caring if needed. Sharon, Donn and Thomas Palmer "
"Hello. I hope this is being read by Justin's parents. I recently learned about Justin's Beach House through my friend Tara Gates. Yesterday I made a donation via paypal, but it didn't allow me to note the reason for the donation, and I wanted to share that with you. Seven years ago yesterday, my cousin's daughter Jennifer died at age 14 of a brain tumor. Jennifer was a bright upbeat honors student who was well-loved by everyone who knew her, and we all thought that her future was limitless. Had she lived, she would be preparing to graduate college this spring, and to move forward to wherever her dreams would take her. Her family, especially her mother, is still reeling from her death just one month after her brain tumor was diagnosed. You can see Jennifer's pictures and read a little about her on the facebook page that her mom and sister set up to honor her -- they know that if Jennifer had lived, she would have loved facebook and the opportunity it would have given her to stay in touch with her family and friends. Jennifer loved the beach and the ocean more than anything. For years I have been looking for some way to honor her in a way that would be truly meaningful to her. By helping to make Justin's Beach House available to families who are dealing with cancer, in memory of a wonderful young man who seemed to share many personality traits with her and who also died of a brain cancer, I can finally do something that we know that Jennifer would truly love. If you have a mailing list for volunteers or potential volunteers for your fundraising events or for work that needs to be done on the house, please add me to that list. We're raising our two granddaughters and so between the demands of an active almost-five year old and her equally active 15 year old sister, my time is often limited, but if there is an event where I can help or we can volunteer as a family, I would love to offer my time to help raise funds for the Justin Jennings Foundation. We will also participate in as many activities as we can. Thank you for honoring your son in such a beautiful and giving way. "Hello! We are glad that you enjoyed the photos. We will be sending a bunch to Debbie and Geoff this weekend. Here are a couple of quotes. You can say they are either from Donnie or Tracy. "The Justin W. Jennings Foundation is a wonderful organization. The weekend get-away that they put together for our family was terrific. It was so nice to just enjoy being together as a family and to be able to put our family's battle with cancer on the back burner for a few days." "We are very excited that things are moving forward for Justin's Beach House. We hope that they are able to make the house into a haven for families who are battling cancer." "Our family had such a wonderful time during our weekend at Bethany. The Justin W. Jennings Foundation did a great job ensuring that we had plenty of things to do and places to go while in town. Watching the Make-A-Wish Sea Colony Triathlon was a blast, and we were simply blown away by Team Nessa. Their dedication to fundraising and training is a real inspiration." "Thank you for all the wonderful sweatshirts. Vaughn and I wear them proudly. Vaughn has sold all the wrist bands you sent and is well on his way collecting cans. I will provide you with an update. He had his annual Halloween Party but this year asked his little friends to bring cans for Justin's Beach House and well, they did! I have a picture to send you. They all made a sign that said JUSTIN CAN and took a picture with all their cans. It is very cute. Since then Vaughn has establised some sites for his can collecting which includes: Wilkes Barre magistrate's office, The Sisters of Mercy Center in Dallas, Wyoming Area Catholic School, and the Suzuki School for Strings. Not to mention word travels fast and there is always a bag of cans waiting for us by our garage. Vaughn is having fun and is very dedicated. We have light up night at our house every Christmas- just a way for family and friends to get together, well everyone brought cans. We were down the beach this weekend and could not beleive the progress. Great job. We plan on entering the Memorial Day Race and can't wait to meet you. We will be sending our check and pictures in the very near furture. Love, Laura and Vaughn Rudloff"